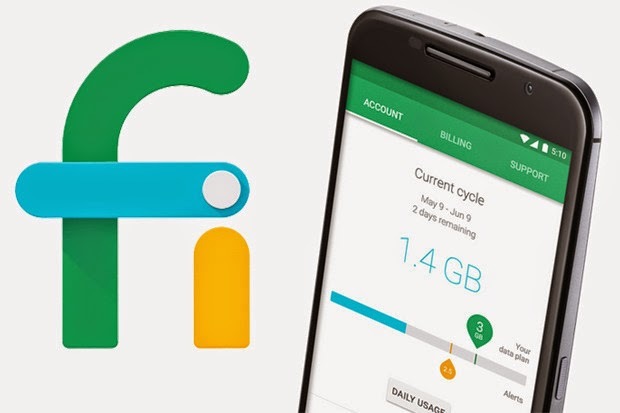 Update 3/7/16: Big announcement from Project Fi today. Invites are no longer required. So thought this was a good time to create a video to show the process of signing up. See below. 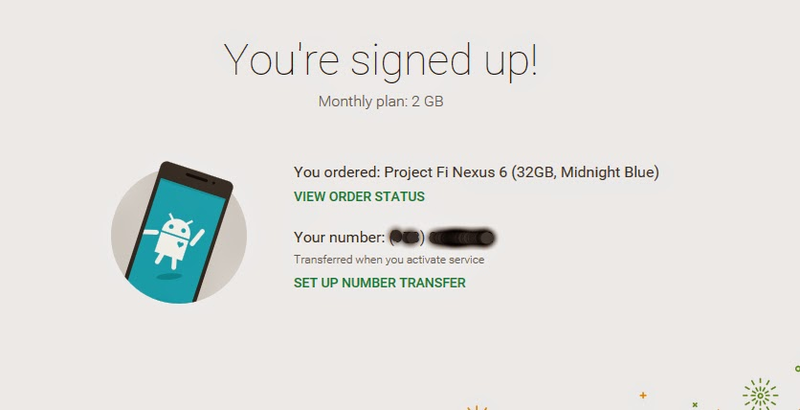 Project Fi invites have started going out to those that requested them and qualified. Here is a run down of the sign up process that I went through. 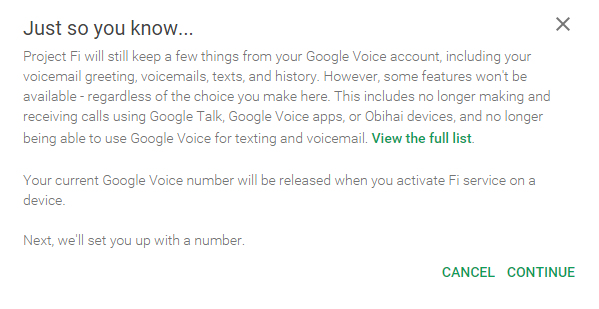 After starting the signup process you will be prompted with a little FYI notifying that certain features from your Google Voice account will remain, while other features won't be available. 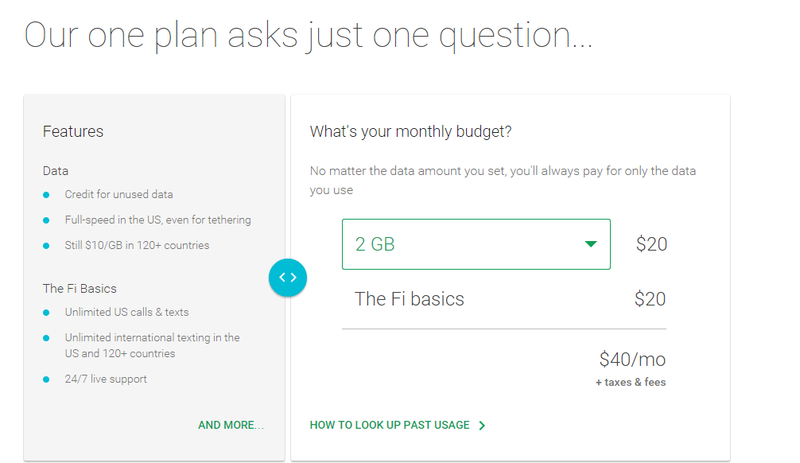 After clicking continue, you are prompted to answer the one question they have about your plan, the amount of data you want. Select the amount and move on to the next screen. Here you are prompted to select your device. At the time of this writing, the Nexus 6 was the only device compatible with Project Fi. Google has stated that other devices would be available in the future. Select the color, storage, and whether paying up front or monthly. The next screen is pretty simple, requesting you to provide the service address where you would be using Project Fi. This screen is to review your selections and shows you what you are paying today and what you will be paying on a monthly basis. If everything looks good, continue on. Next is the obligatory legal mumbo jumbo all carriers make you agree to. Just click agree and move on to the next screen. 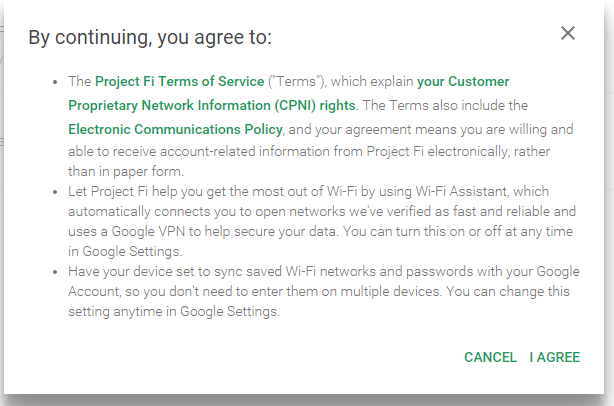 Project Fi requires that you use Google Wallet for payment. 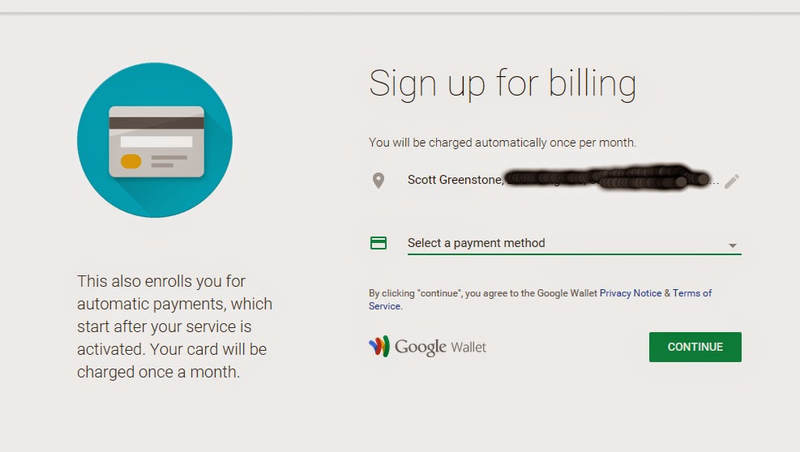 Here you setup the payment method you want the monthly bills to be charged to. Make your selection and click continue. Here is your standard purchase review screen for the device you are paying for today. 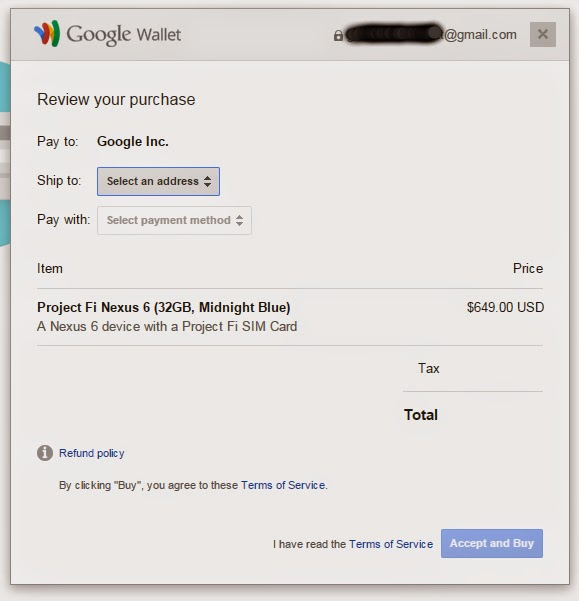 Select the shipping address and what payment method from Google Wallet you want, and click Accept and Buy. Here is the great part - You're signed up. All that is left is to transfer your number (if you are going that route). Transfer/Number setup occurs at the time you set your device up. On the bottom of the You're Signed Up page you can get the ball rolling with # transfer by filling out the information from your current carrier. 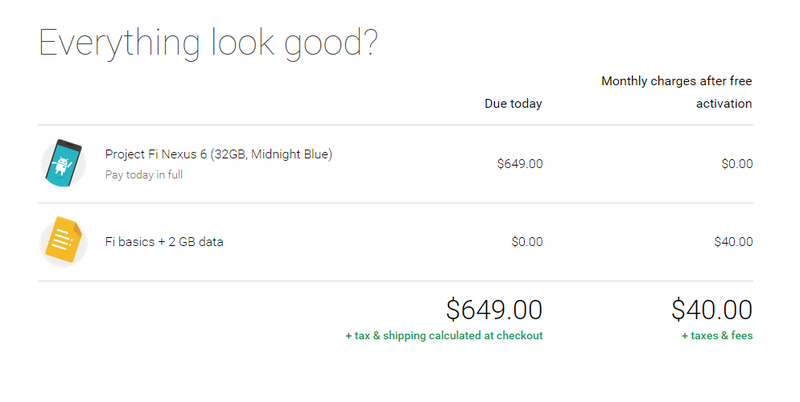 Next all you have to do is wait for your phone to arrive and start making Project Fi. Calls. I must say, the process to sign up for this service was the simplest I have ever experienced, and I have had service with AT&T, Verizon, and T-Mobile. 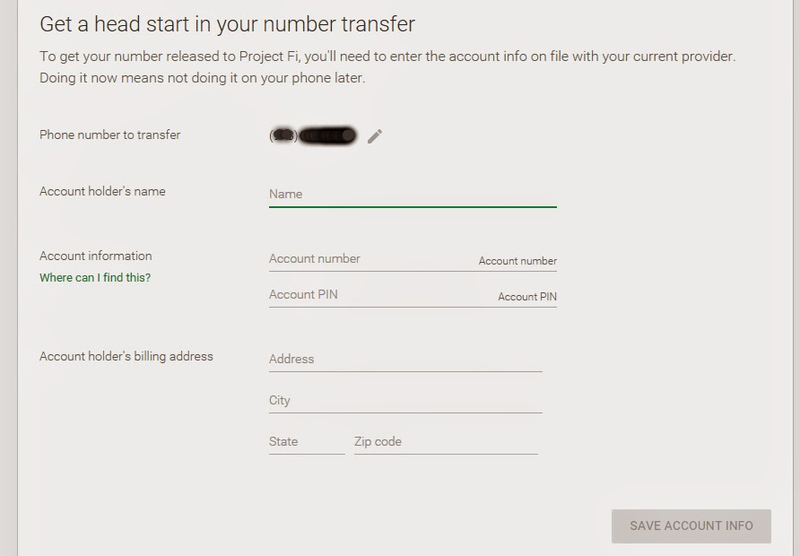 If at any time you need assistance with Project Fi, you can go to the support site or to the Google + Community.